Simon Says A Bit O’ Green! Thank you for joining us for the Feminine Challenge and we hope you will all join us again this week too. This week we are showcasing Taylored Expressions Products this week. You don’t have to use them for the challenge but if you have them we would love to see them used. There are all the colours of the rainbow on my card along with a bit of green. I followed the challenge title to the T! Taylored Expressions dies are one of my favourite. They are unique and you can combine their dies to create a scene as they all coordinate well with each other. That is what I have done with my card. 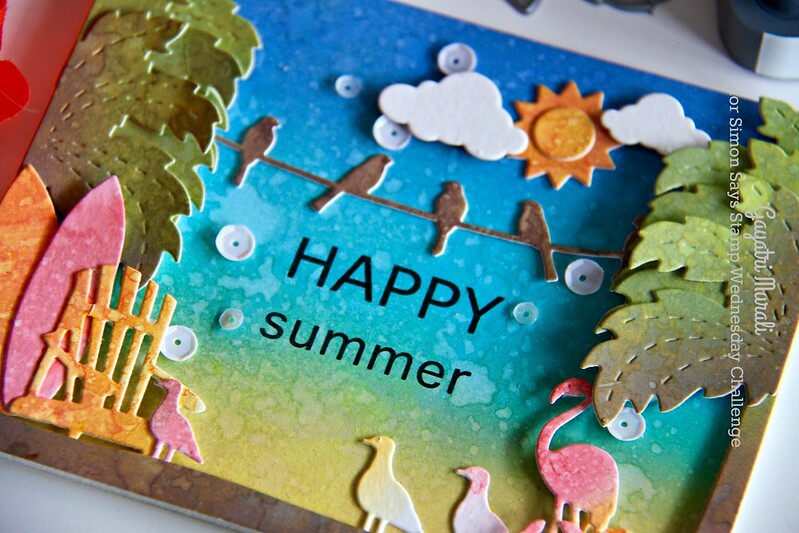 I have used On the Line Beach die set along with Little Bits Adirondack Chair, Little Bits: Sun and Clouds and Skinny Mini Borders Spring dies to create my scene. And to add colours to my elements, I have used the new Distress Oxide inks. For my background, I sponged Fossilzed Amber, Broken China and Faded Jeans distress oxide inks, added water spatter and heat set to get that chalky look to the oxide. On an another bristol paper, I sponged Peeled Paint and Vintage Photo distress oxide inks, spattered with water, heat set before using the On the line Beach die to die cut the palm trees. I also die cut four of the stitched detail leaves of the palm tree which I layered one behind and one on top of the base trees. I adhered this on the background using foam adhesives. I similarly repeated the process of distress inks to die cut all the other elements for the card. Only the clouds don’t have any colour on them. The sentiment is from Simon Says Stamp Pool Play stamp set stamped using black ink and MISTI. Finally the card is embellished with Snow Flurries sequins. Here are couple of closeups photos of the card. 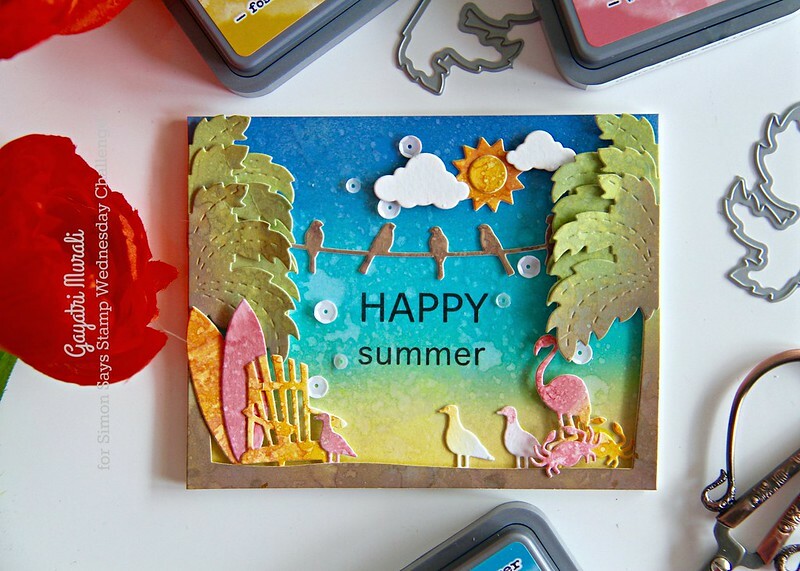 What a fun scene, Gayatri – and a great sampler of the new oxide inks!! EEEE! 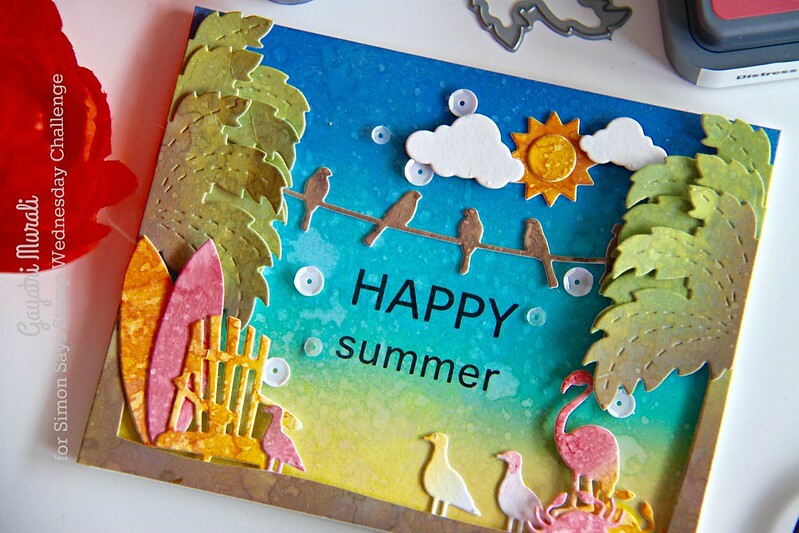 I love the vibrancy of all of your die cut elements. This is how you create a scene!! Gorgeous make! Outstanding card today! I bet this will be pinned hundreds of times. Love,love,love this card. Escape the snow, grab a board and go surf with the flamingos. The colours are beautiful. Your work is always a wonder to look through, thank you for sharing your talent. Beautiful card. I love your use of colors and dimension on it. This is fabulous! Gantastic colouring. Wow thats an amazing scene and beautifully coloured too! Just love it! Love the fabulous background! !Super fun scene too! Awesome card!